The Court Liaison Program (CLP) is a collaboration between the Los Angeles County Department of Mental Health (DMH) and the Los Angeles County Superior Court. It is staffed by a team of 14 mental health clinicians who are co-located at 20 courts countywide. This program incorporates the “no wrong door” philosophy by offering the courtroom as an entry point for services. The objectives of the program are to increase coordination and collaboration between the criminal justice and mental health systems, improve access to mental health services and supports, and enhance continuity of care. The CLP further aims to provide ongoing support to families and to educate the court and the community at large regarding the specific needs of these individuals. Participation is voluntary and available to those 18 and above. 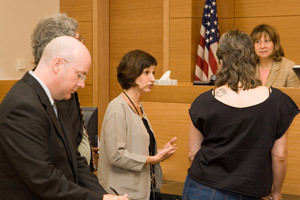 Court Liaison Program staff coordinate and integrate services between the courts, Jail Mental Health and community based Service Area Navigators, with particular focus on balancing the needs of individuals and the expectations of the judicial system. The CLP endorses a culture of collaboration within each courtroom where the CLP staff are present, and the department core values of HOPE, WELLNESS & RECOVERY to the criminal justice system as a whole. Our Advice: Get Some Advice! This entry was posted in Advocacy, Law, Programs, Public Services and tagged Criminal justice, Los Angeles County Superior Court, Mental health, Mental health court. Bookmark the permalink.